Gurgaon-based Aaidea solutions Pvt. 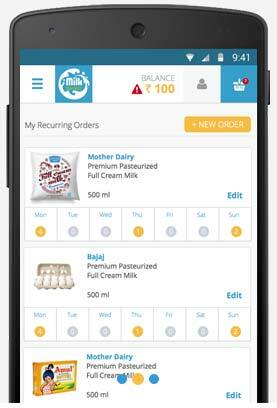 Ltd, which runs micro-delivery grocery startup Milkbasket, has raised $500,000 (Rs 3.3 crore) in a pre-Series A funding round led by venture capital firm EVC Ventures. Chinese investors Peter Zou, CEO of YeahMobi, and Li Jian, founder of Zhu Dao Investments, also put money in the round, Milkbasket founder Anant Goel told Techcircle.in. Snapdeal vice presidents Vikas Banga and Manav Kamboj invested as well. The company will use the funds to expand its core team, enhance technology and beef up the logistics network. Goel said the company is aiming for a 10-fold growth in customers in next four to five months and a three-fold increase in per-customer spend. Anant Goel founded Milkbasket in 2015 along with Ashish Goel, Anurag Jain and Yatish Talavadia. The asset-light startup aims to fulfil the daily grocery and household needs of customers. Milkbasket makes deliveries by 7am each morning. It operates in 15 clusters in Gurgaon with each cluster having 500 users. The startup initially delivered only milk but now offers about 3,000 products through a hybrid inventory model. Milkbasket follows a prepaid model where users must deposit at least Rs 500 when they sign up. The company says its app has recorded about 1,000 downloads so far. Anjli Jain, managing partner at EVC, said Milkbasket is part of the second generation of Indian e-commerce startups that have learnt from the mistakes committed by its predecessors. The funding for Milkbasket comes at a time when the hyperlocal grocery segment is going through a tough period. One of the most heavily funded players in the segment, PepperTap, closed its hyperlocal delivery business last week. In January, hyperlocal grocery and fresh food delivery startup Grofers shut down its operations in nine cities. Mumbai-based LocalBanya, a three-year-old online supermarket, stopped taking orders in October 2015.